Rolling hills, very few tourists, warming Tuscan food, breathtaking views and unique wines — these were some of the highlights of our stay in Montepulciano – a small town in the province of Siena, Italy. 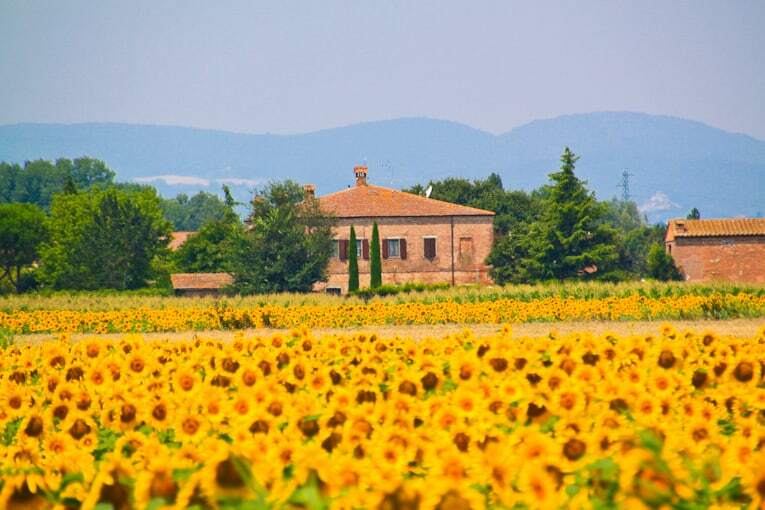 We had been to Tuscany before but hadn’t been to Montepulciano, so this time we were excited to see a new region and relax after the two weeks we spent in bustling Rome. We found out our car had a slow leak in one of the tires about 2 hours into our journey and that the tire was almost flat. Yes, an Italian on a scooter flagged us down and managed to communicate that to us in Italian (no English). No, we had no idea what to do – we were in the middle of nowhere and the car didn’t have a spare. 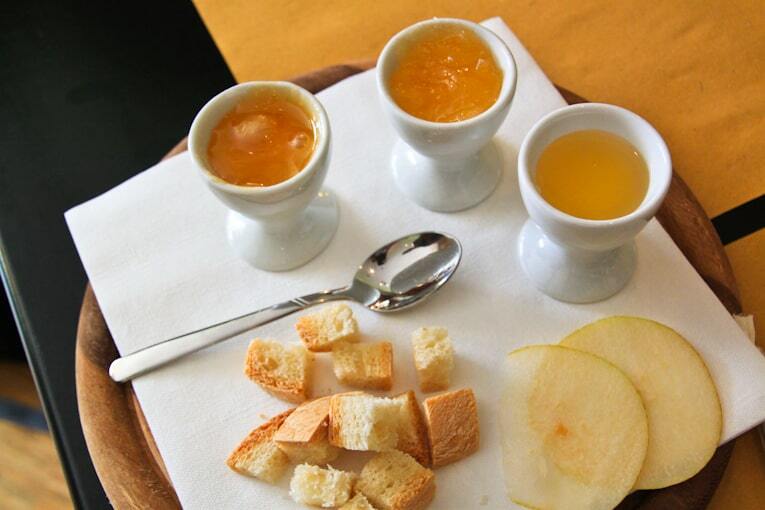 Meanwhile, while getting to our Montepulciano B&B…. Yes, we almost drove off a cliff on a tiny, unpaved Tuscan road. No, the car didn’t fall off the cliff. Yes, the back wheel of the car was hanging off the cliff. No, somehow we didn’t think to look back before we reversed. We stayed at the Relais San Bruno, one of the most beautiful B&B style hotels I’ve every stayed at. The grounds were huge, we got our own private “villa,” and the entire place just felt meant for relaxing. It was also super close to the town (but far enough away that you felt secluded), so it was the best of both worlds. The owners were great, really helpful and gave awesome recommendations on restaurants and wineries to visit. 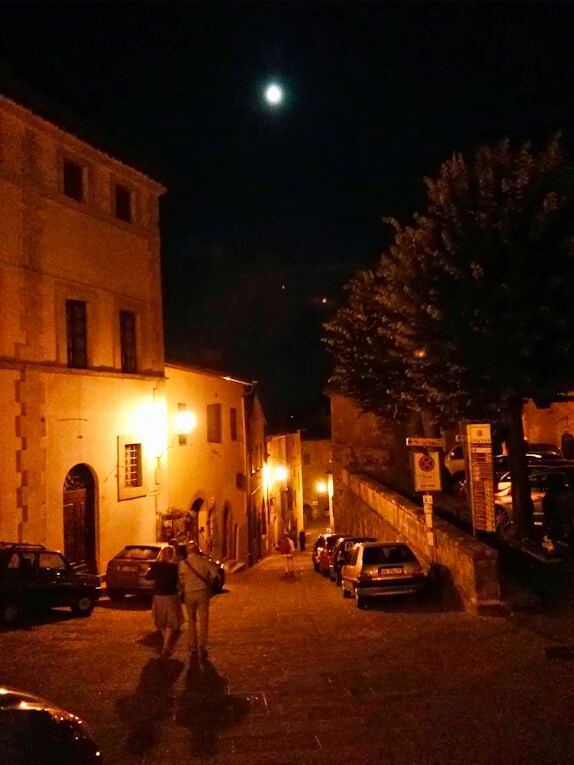 Our first night in Montepulciano, we had dinner at La Grotta, one of the best restaurants in the region. The service was impeccable, and they have an outdoor garden that is wonderful for dining in the summer. We started with their warm, house made garlic and walnut breads (to die for). 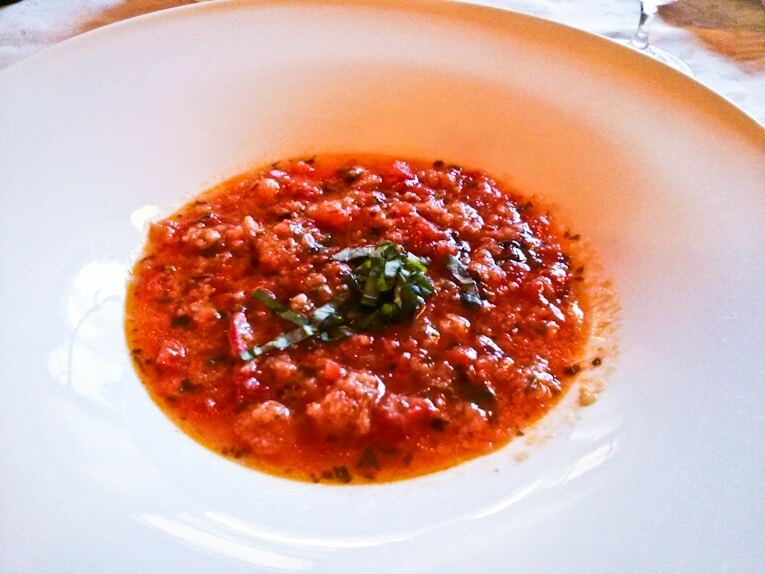 Then I had the Tuscan tomato soup with garlic, bread and basil – a classic Tuscan dish where the bread is used to thicken the soup. It reminded me of a deconstructed bruschetta — the flavors just exploded in your mouth. 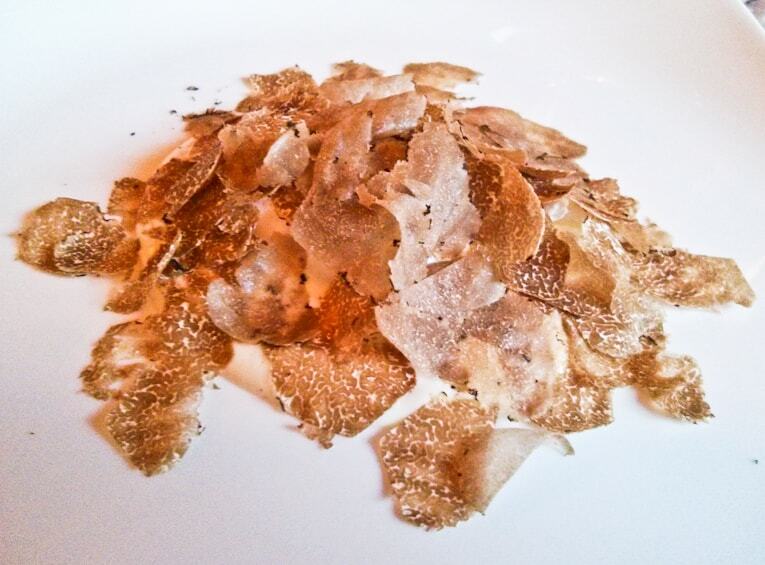 The husband ordered the steamed soft egg topped with shaved pecorino cheese and shaved fresh truffles. Our entrees: “Irregular” home made pasta with tomato, garlic and swiss chard. And the Aubergine alla parmigiana – grilled zucchini, and spinach with garlic. This is not your typical eggplant parmesan. The eggplant was SUPER thinly sliced, layered with tomatoes and baked with mozzarella in the oven. It was served with the zucchini also shaved in thin slices and the spinach on the side. Filling but not heavy. 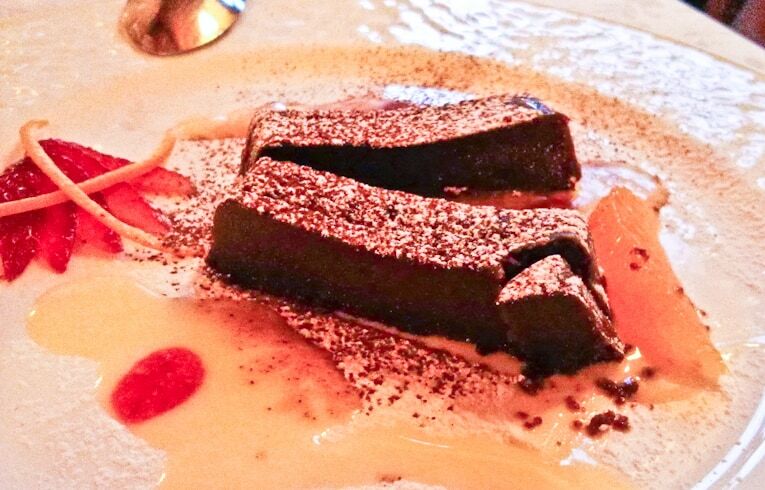 And finally, for dessert – Bitter chocolate terrine with English cream. How happy do those sunflowers look? I still can’t get over how they turn and face the sun throughout the day – so cool! 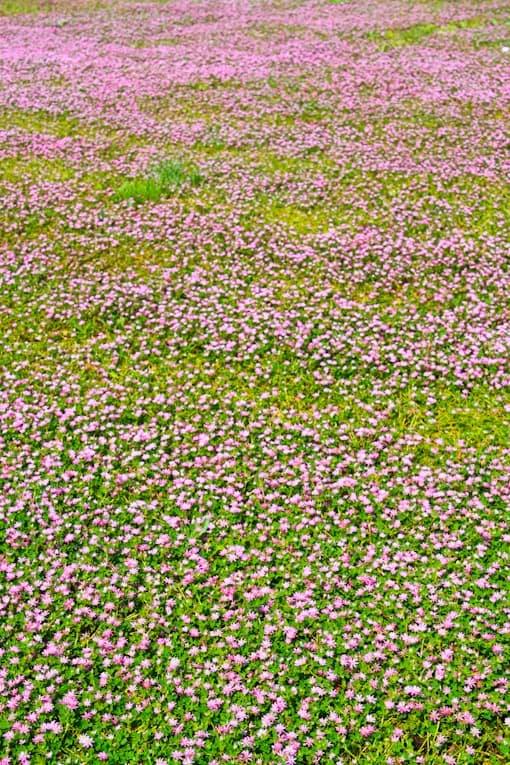 We also saw some expansive wildflower fields and farmland. At times it felt like we were in a painting. 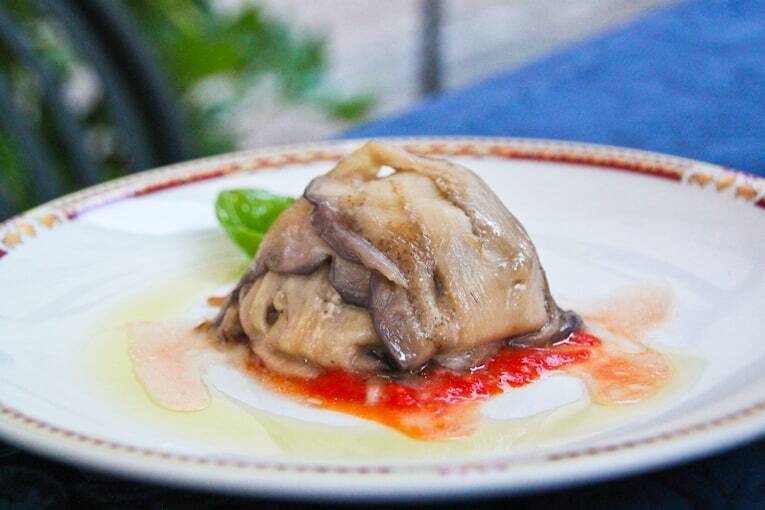 In the town of Montepulciano, we found one tiny restaurant that happened to have really delicious food. It was called La Dolce Vita Enoteca: a wine bar/restaurant where we grabbed dinner one night. I was surprised at how flavorful and fresh the food tasted – and they had some great wines too! 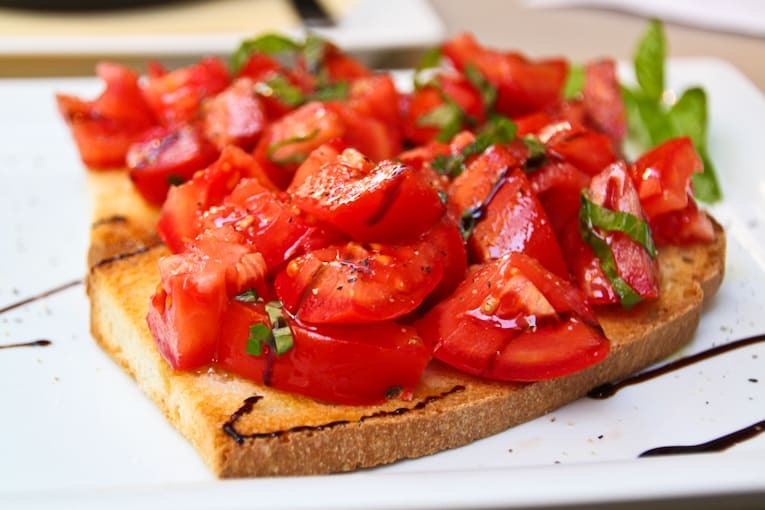 We had the Bruschetta – which in Italy is like nothing you’ve ever tasted. 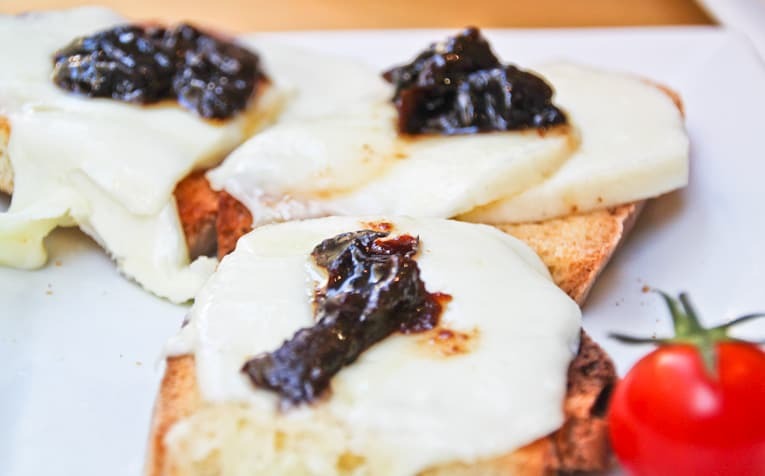 And bruschetta with pecorino, prunes, and honey. 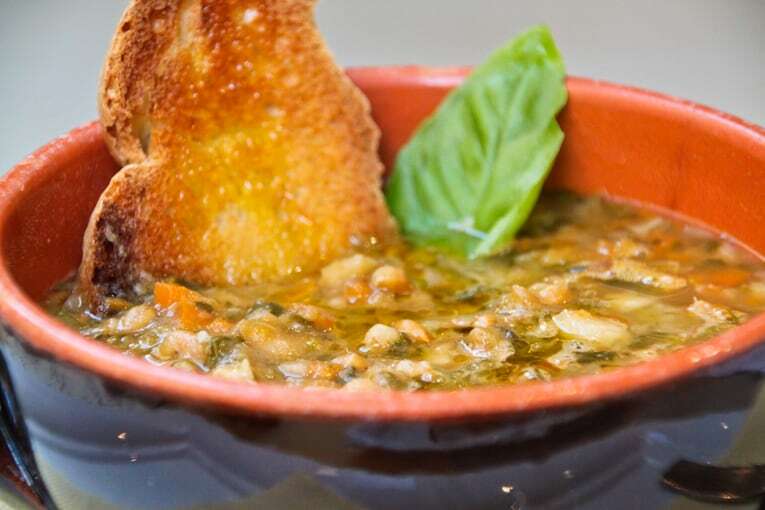 Simple but flavorful – a true Tuscan meal. Our visit to the coppersmith. 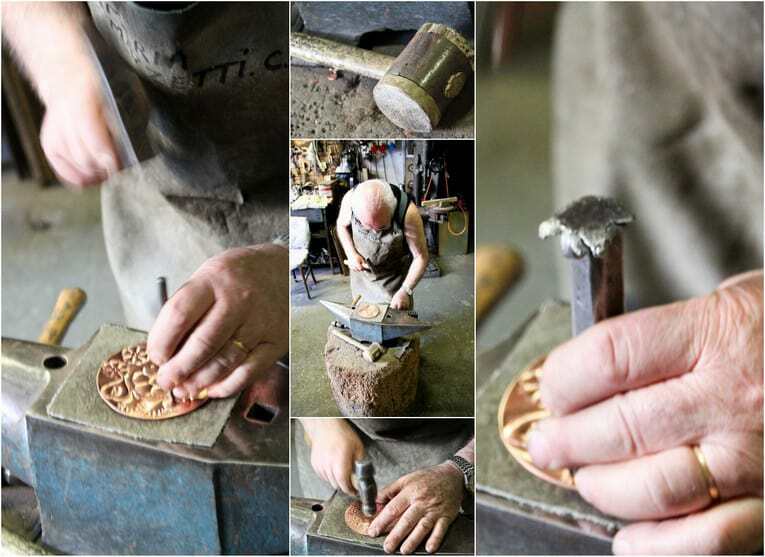 Yes, that’s right, a real-life coppersmith. He is the sweetest person we have ever met. He speaks no English – he talks to you in Italian but somehow through gestures and broken understanding it’s very easy to communicate! He is just genuinely interested in meeting people and learning about them. 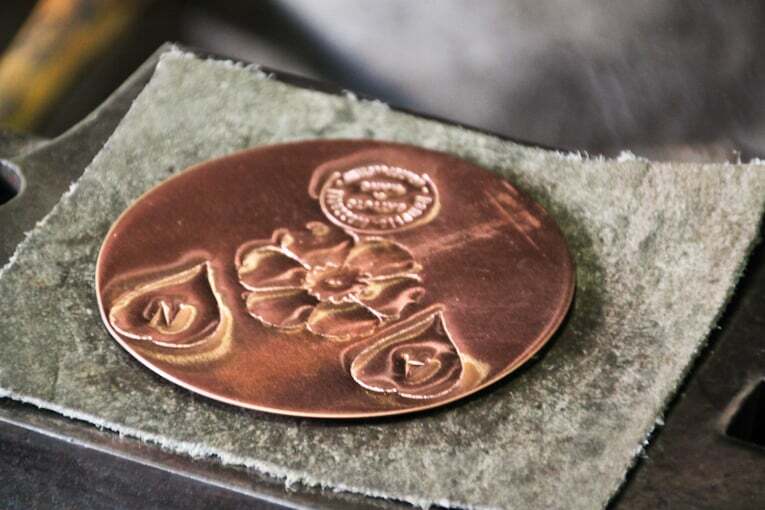 When he met me and the husband, he wanted to create a little bronze plate commemorating our anniversary – it’s something he and his wife had done for themselves over 50 years ago (yes, they’ve been married for 50 years and are the cutest couple ever). The shop is a little hole in the wall off the main piazza in Montepulciano. It’s not touristy at all – you would totally miss it if you didn’t look hard for it! Oh and the best part, for the plate he made us – he didn’t charge for it at all – we realized that it’s just his way of meeting new people and forming relationships – so cool. He does have an actual shop, which his wife runs (he called her the “Finance Minister” – ha!) We ended up buying a beautiful bronze pot from them that is now displayed on one of our bookshelves. And we have our copper plate to match. Such an interesting and unique experience that we just happened to stumble across! 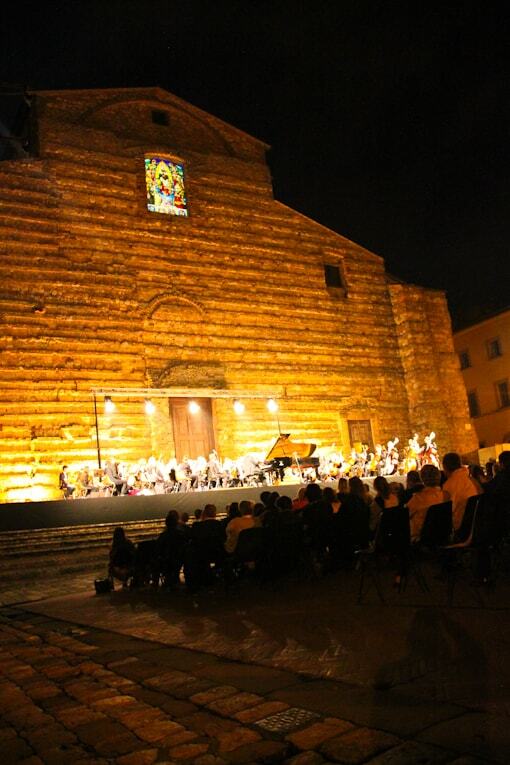 Another highlight of our visit was an outdoor Symphony / concert that we were able to watch one night (due to a music festival that happened to be going on while we were staying in town). It also ended up being an unusually cold/foggy night, which just made for even more great scenic photos of the town. 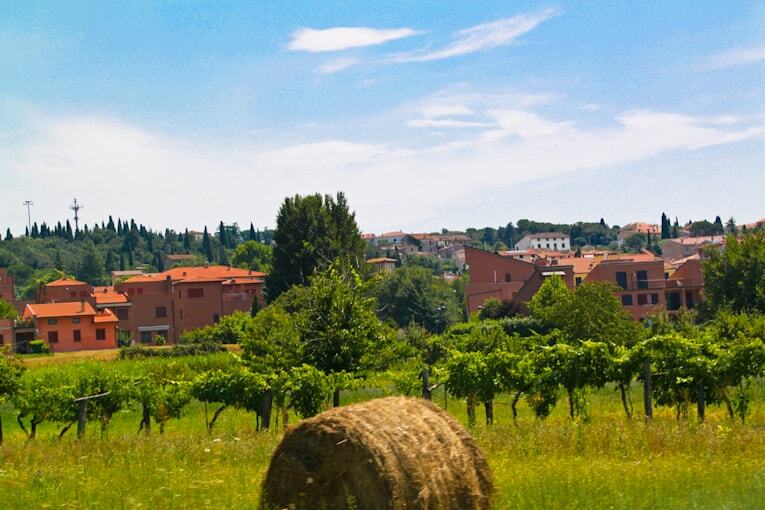 The next day, we headed to Avignonesi winery for what turned out to be an almost all-day wine tour and 5 course lunch. Avignonesi is the only organic/biodynamic-certified winery in the region – and they showed us all of the measures they take to make sure their wine is free from all pesticides, contaminants, etc. It really made me respect their winemaking process. 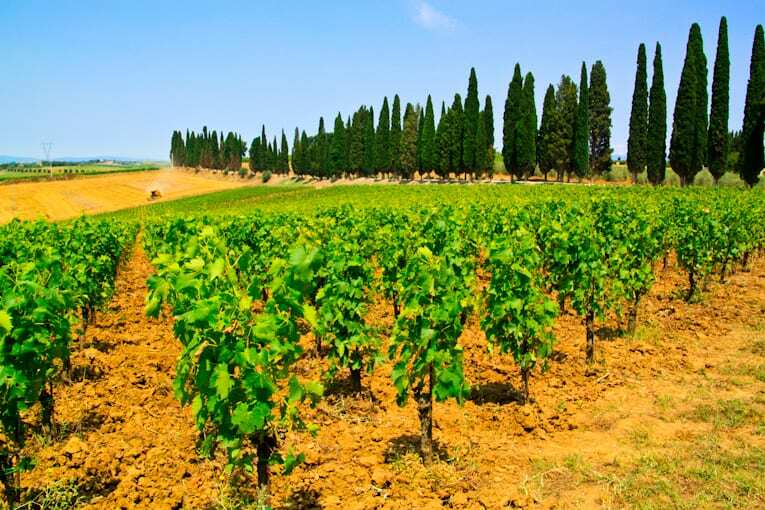 Montepulciano is known for its Vino Nobiles, while Montalcino is famous for Brunellos. 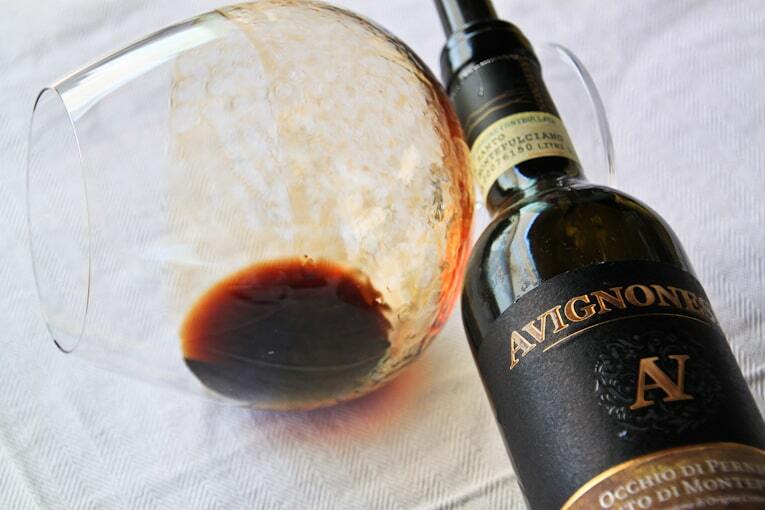 Avignonesi, of course, makes Vino Nobiles, among a selection of many other wines (Cabernets, Merlots, Malvasia, Chardonnay, and Vin Santo to name a few). 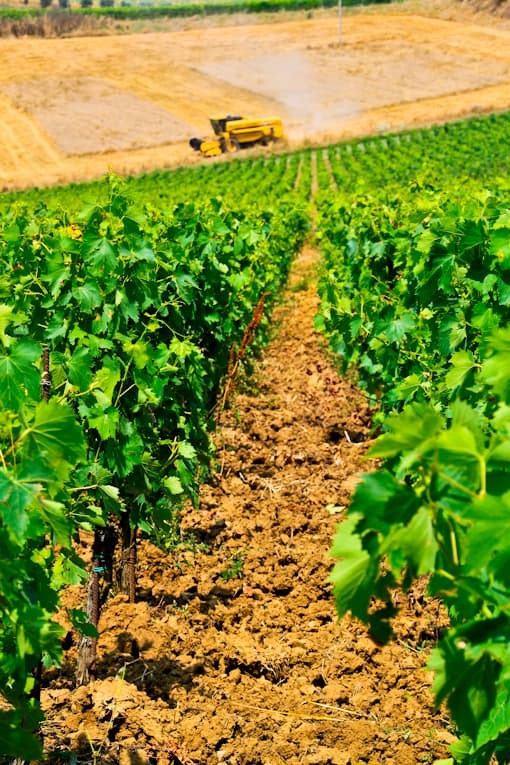 We were impressed with their wines and the grounds – they took the time to show us how their wine is made, what factors they consider when recommending varietals, pairing with food, etc. After our wine tour, we headed to lunch in their outdoor dining room facing the vineyards. This was like the meal that kept on giving. 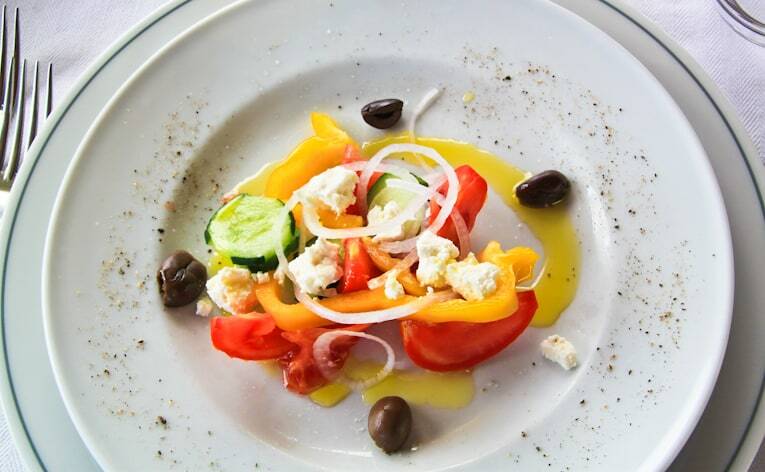 Our First Course: A fresh salad with goat cheese, tomatoes, cucumbers, onions, yellow peppers, salt and pepper. The vegetables were so fresh and crispy it felt like they had been brought from the garden that morning. 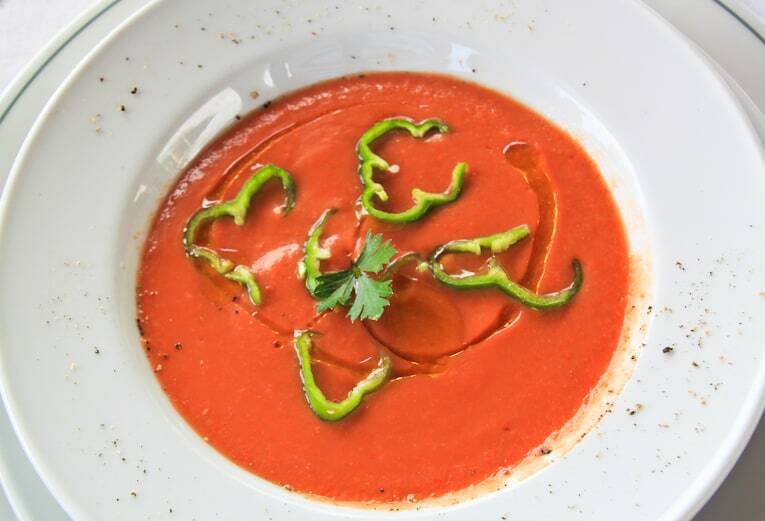 Second course: A cool summer soup with tomatoes and green peppers served with paprika grilled bread (gaspacho style). 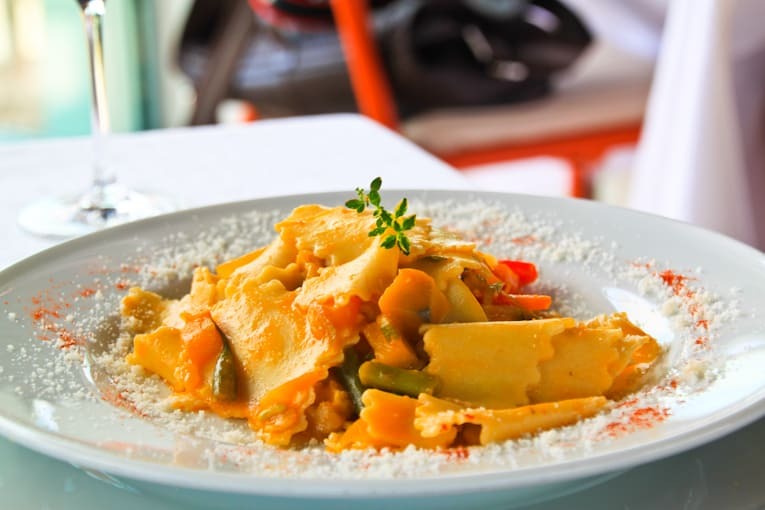 Third course: Homemade maltagliati pasta with vegetable sauce and saffron from Val d’Orcia (the sauce was made from pureed veggies, seasoned with saffron, and tossed with the pasta). 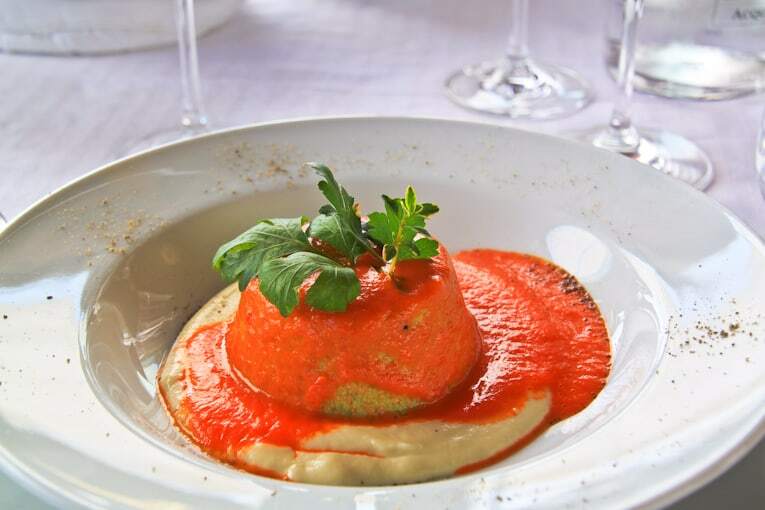 Fourth course: A broad bean and red pepper flan served on a puree of pecorino and red pepper sauce. I’m not usually a fan of flan, and I had never had a savory flan before, but this was actually pretty good. It was somewhat one-note but still really well made. Dessert #1 was the provociazone: A mini tasting plate with Vin Santo pairings: dark chocolate truffle with ginger, fresh raspberry sorbet served on a super thin biscuit, a walnut cookie, a caramelized slice of super thin orange, goat cheese cream with poppy seeds, a leaf of fried sage, and a salted fresh caramel. 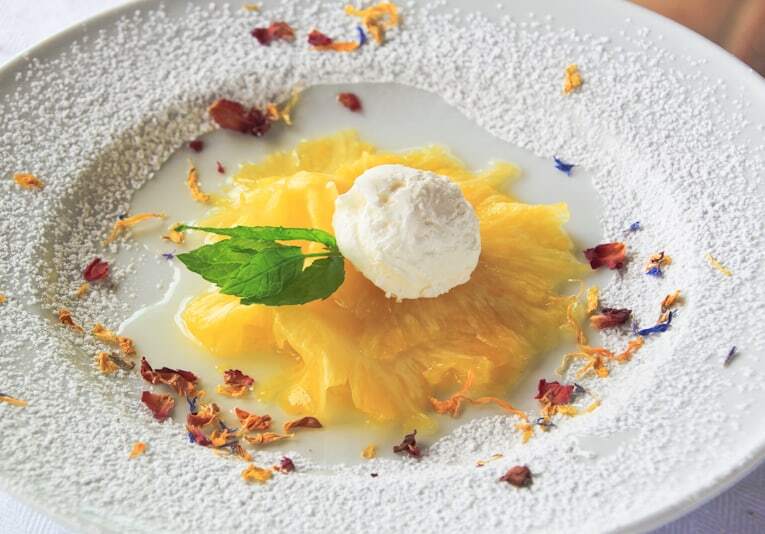 Dessert #2: Pineapple carpaccio marinated in a dry martini and served with homemade coconut ice cream. The Vin Santo was so cool – it’s such a heavily reduced wine that it takes 10 years to make, and it literally coats the outside of the glass. Needless to say, after that meal we were full for the rest of the day! 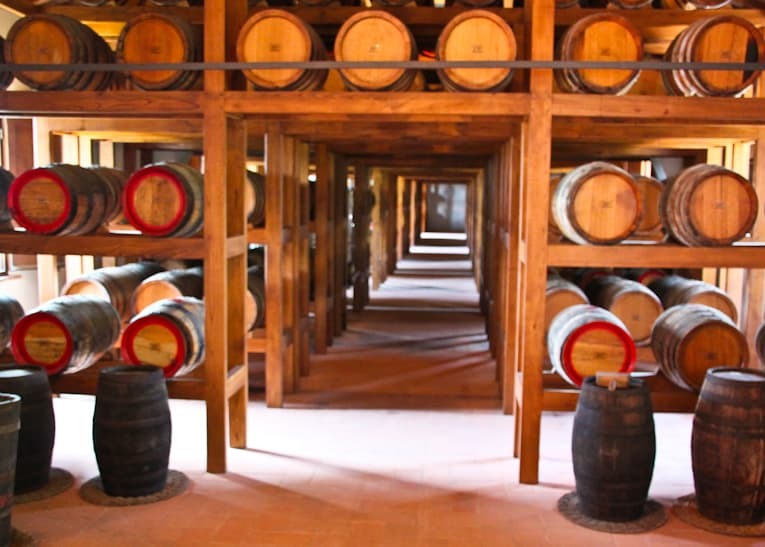 The next morning we headed to Montalcino, where we visited Casanova di Neri winery. The wines were excellent, but the winery itself had horrible service. It was like they didn’t even care that you were there. 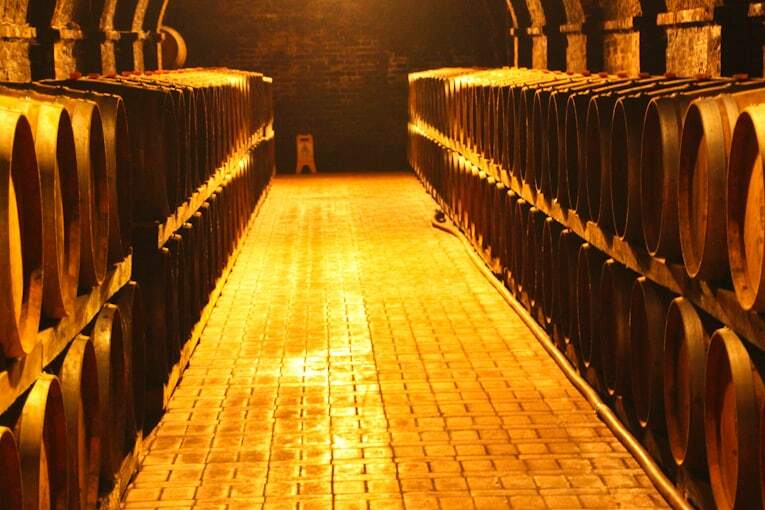 I’d recommend just going to a tasting shop and trying some of their wines – not worth visiting the actual winery. 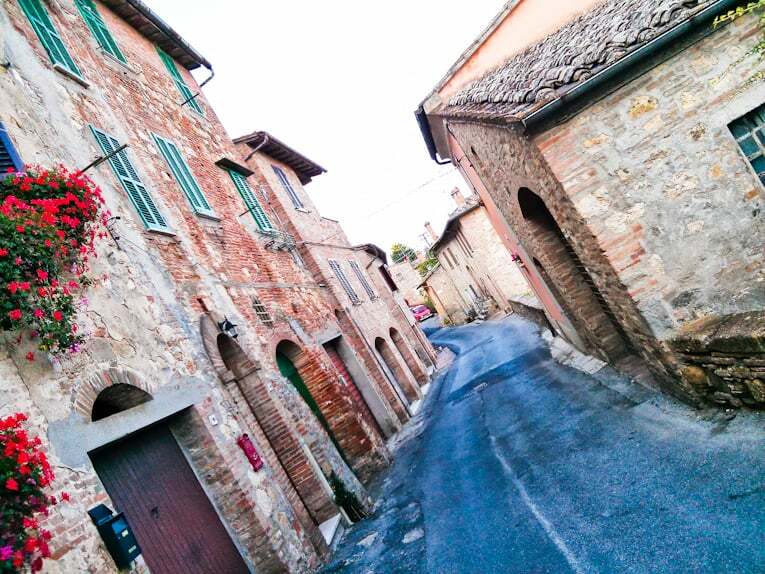 Montalcino itself is a cute little town that’s worth exploring. We also found an awesome bakery where the husband had to get a slice of cheesecake. 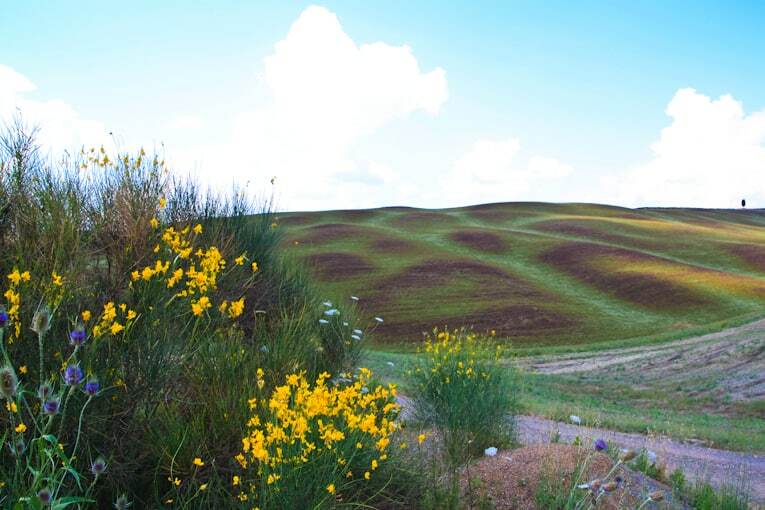 On the way back from Montalcino we couldn’t get enough of the rolling Tuscan hills. Totally worth the hike up the hill for the view. On our last day in Tuscany, we ventured over to Pienza: the most picturesque small town you will ever see. They are famous for their Pecorino cheese. 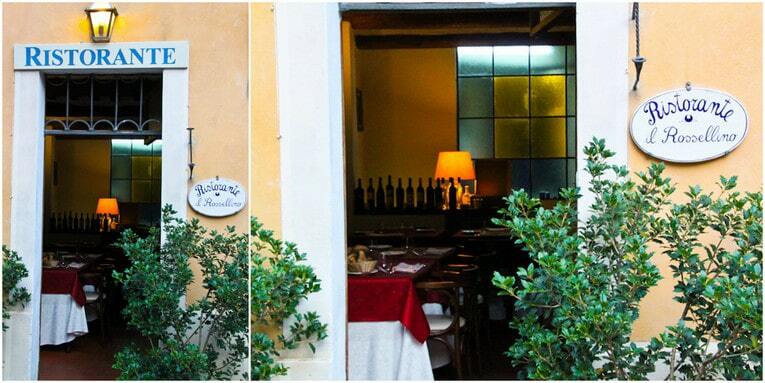 We had dinner at this tiny restaurant run by an old couple: Ristorante Il Rossellino. 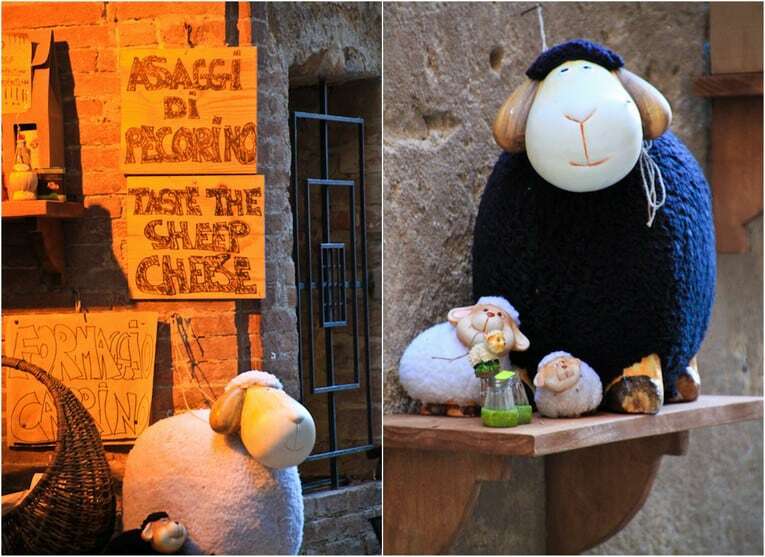 If you ever are in Pienza, you HAVE to eat here. It’s located in Piazza di Spagna, but it’s so tiny you really have to search for it to find it. The inside of the restaurant literally has 4 tables, and the kitchen. In the summer, they put some tables outside to accommodate more people, but in total I’d say about 10-12 people can dine here every night. 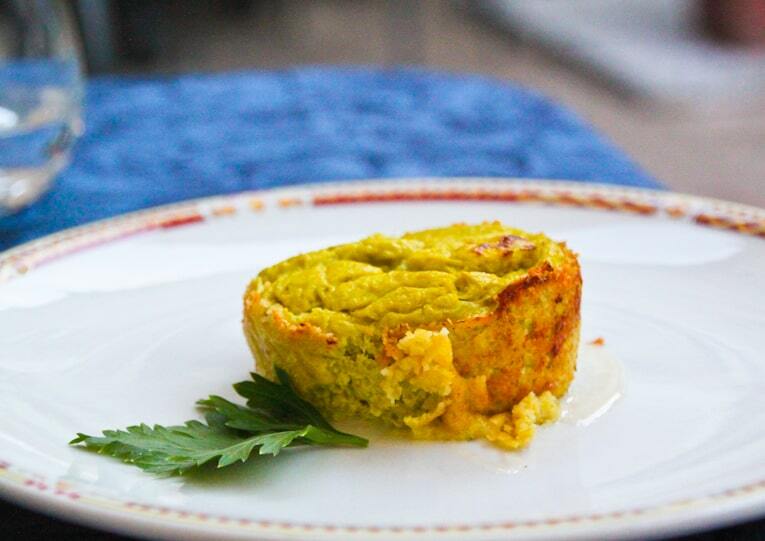 Our appetizers were an Asparagus souffle over a pecorino cheese sauce. And an eggplant and mozzarella layered dish over a tomato/olive oil puree. I know, the eggplant dish looks kind of gross, but I promise it tasted amazing. 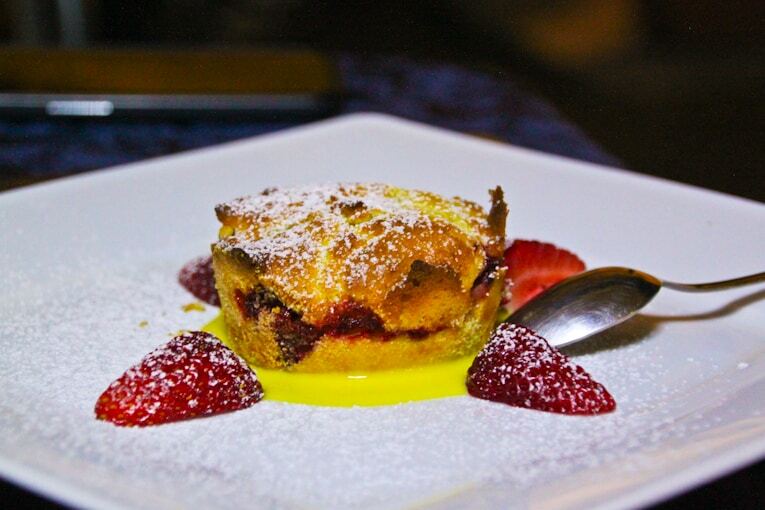 The souffle was good too, although it was a little too eggy for my tastes (the husband really liked it though). 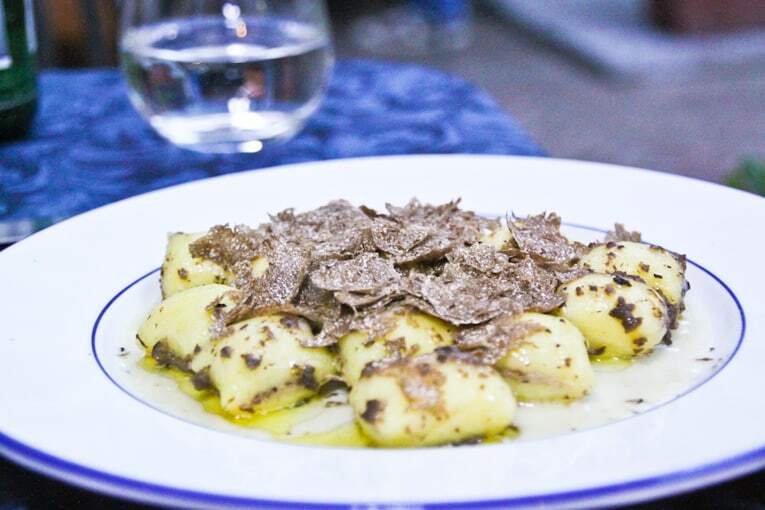 Then came our star dish for the night: gnocchi made with fresh truffles, shaved right over the top. I have never had gnocchi that tasted this good in my life. 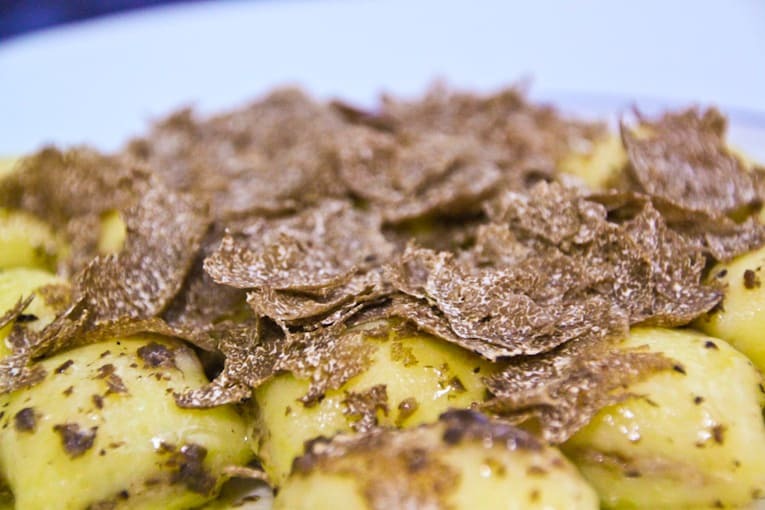 And can you just take a look at the truffles? 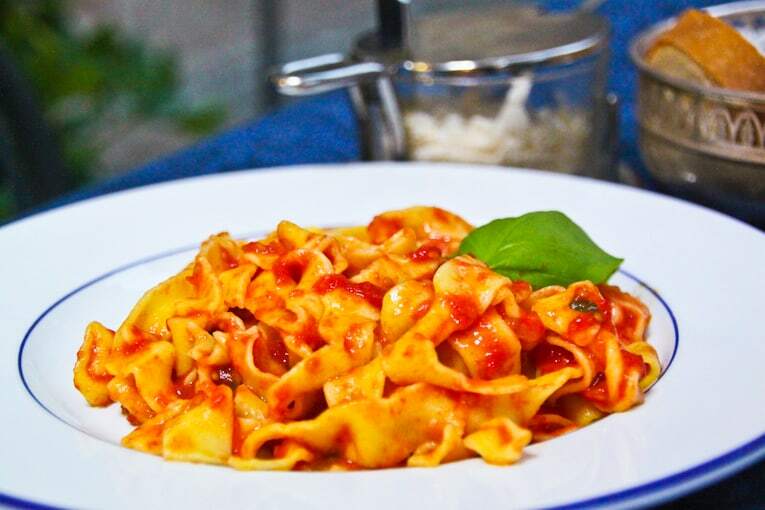 We also had a homemade tagliatelle with a fresh tomato sauce. Still delicious but nothing compared to those truffles. The husband and I came home still thinking about those truffles. Dessert was out of control. 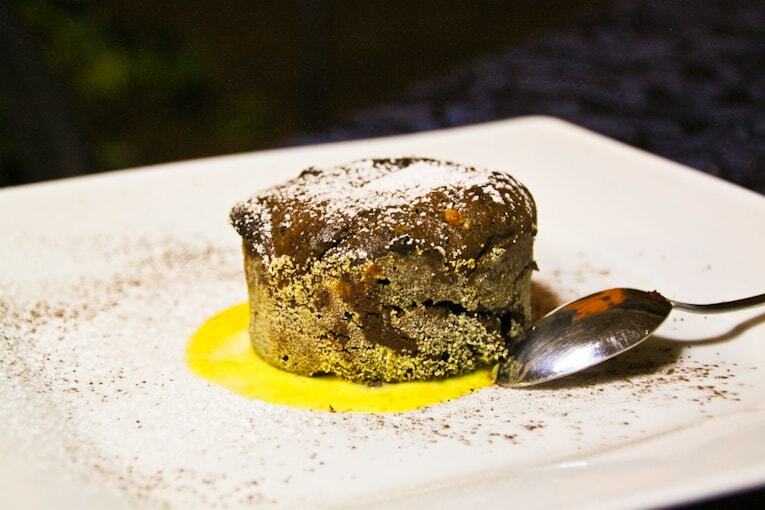 First we had a warm, chocolate souffle with chocolate fudge inside. It was about the most perfect chocolate “lava” type cake I’ve had. Then we had a warm, pastry-esque cake with strawberries. 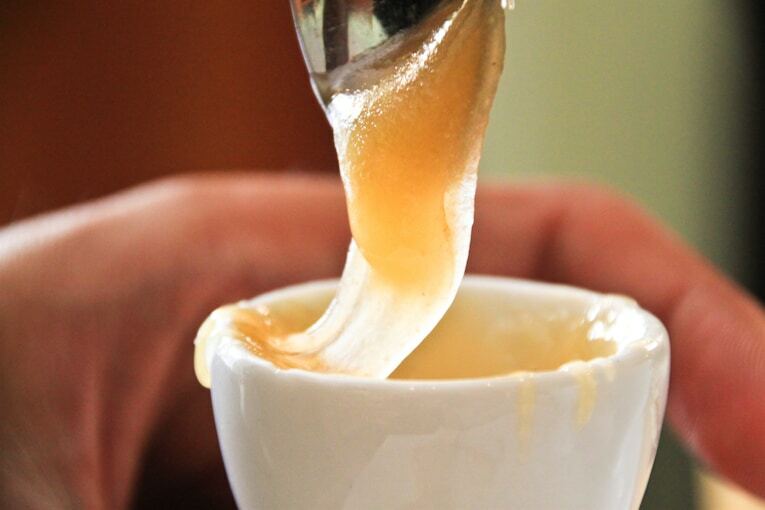 Filled with a fresh vanilla custard, served on top of an orange sauce. Might be one of the best desserts we have ever had in our lives. It disappeared in approximately 5 seconds. When we were done with dinner we had a chance to talk with the owner and cook, Enzo. He had come out between each course to check on us and to show us the food he was cooking before he cooked it. It was like eating at someone’s (gourmet, 5 star) house. After dinner we thanked him for the delicious meal and took a picture with him. He was the best. After that night we packed our bags and headed to Salina, one of the Aeolian Islands, and our last destination in our month-long Italy trip! But before that we did get a chance to drive through the Tuscan hills on our way to the airport, one last time. Wonderful blog! Nice job, Anjali. I am passing this on to my wife. 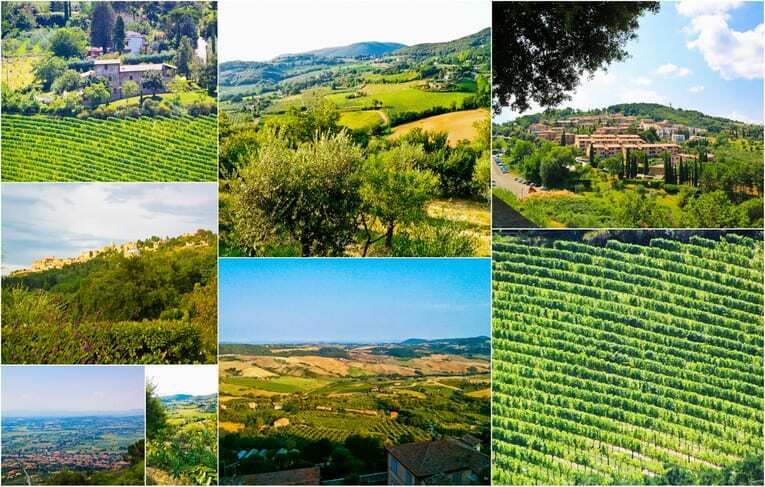 We love to visit Italy, but have never visited the Montepulciano area before – and that will now change! Thank you! Oh, my goodness! I just happened upon your blog – it’s awesome. Thank you! A friend and I are going to be in Tuscany for 3-4 days in late September. It is crazy trying to decide where to stay, eat, sightsee! Your information has been quite helpful. Thanks again. Thanks so much Barb!! 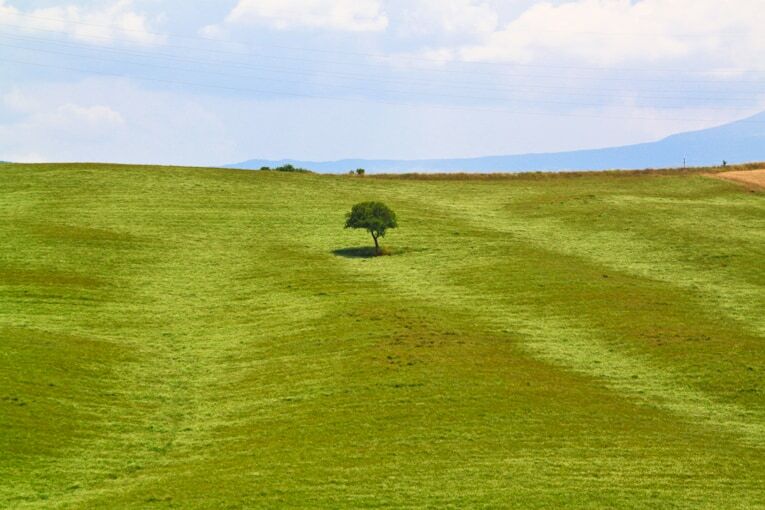 So glad this post was helpful for you as you planned your trip to Tuscany! You will have an absolutely amazing time – September is a great time to go and it’s such a gorgeous region! Hello Anjali, please do not update your post as you were right, Montepulciano believe me (or check on wikipedia 😉 ) has nothing to do with the Chianti region neither geographically nor historically or, more important, as wine production area. 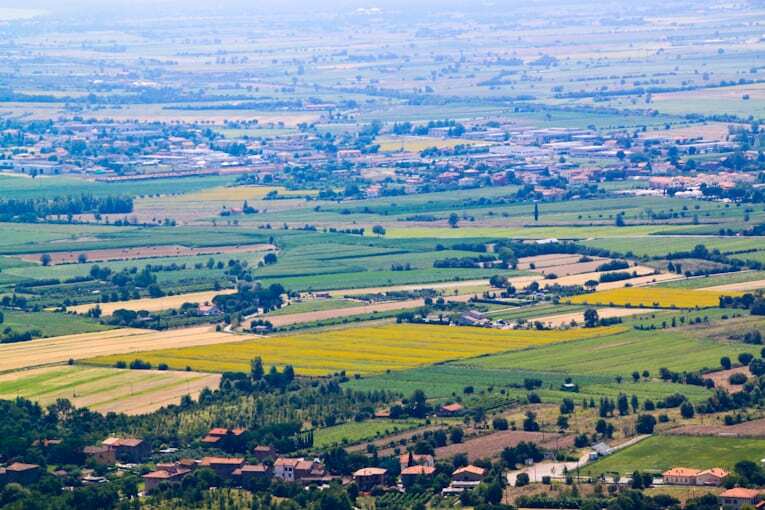 Montepulciano is located between Valdichiana and Valdorcia regions, about 80 km south of Gaiole in Chianti (considered the heart of Chianti). 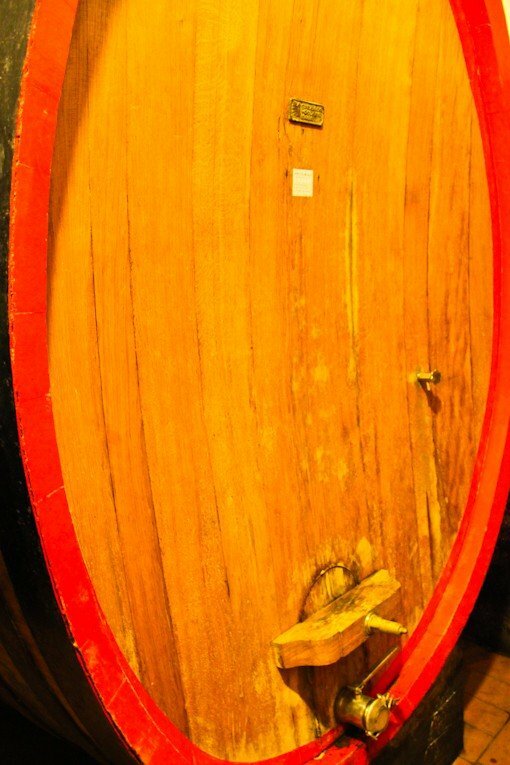 Montepulciano has its own wine denomination (DOCG) called Vino Nobile or Rosso di Montepulciano, nothing to do with Chianti DOGC. Said that, both regions and wines are excellent. Haha! Thanks for the tip Giacmo! 🙂 That is great to know! 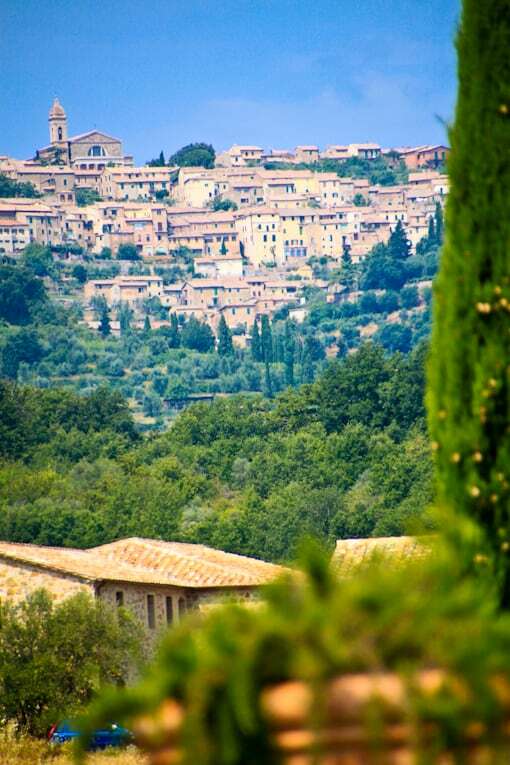 Just came across your blog as we are going to stay for a month at a villa in the hills just below Montepulciano. Just wanted to correct your statement that having stayed in the chianti region before, you wanted to try another area of Tuscany. 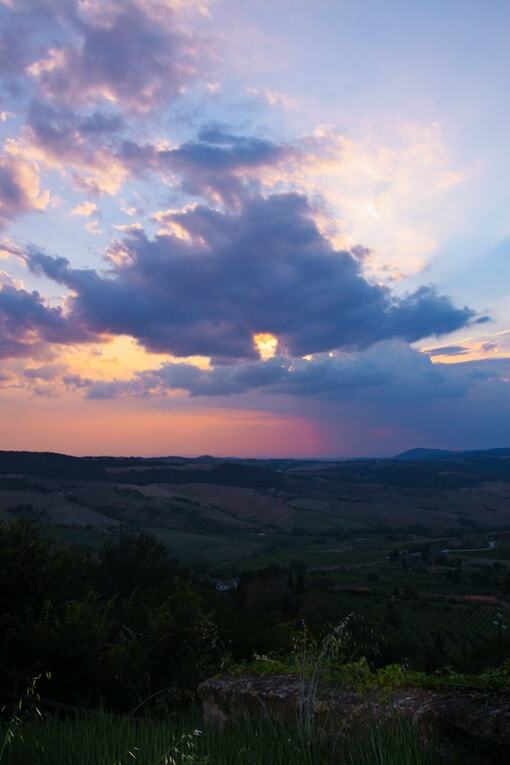 Correction: Montepulciano is in the HEART of the chianti region! So you had two lovely stays in the same region of Tuscany. Good catch! 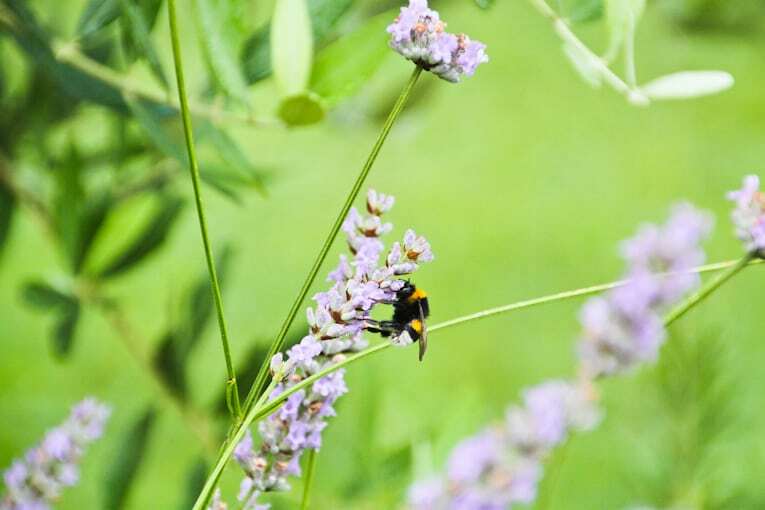 Thanks Rosemary – I have updated my post!! 🙂 Have a great time during your stay in Montepulciano! 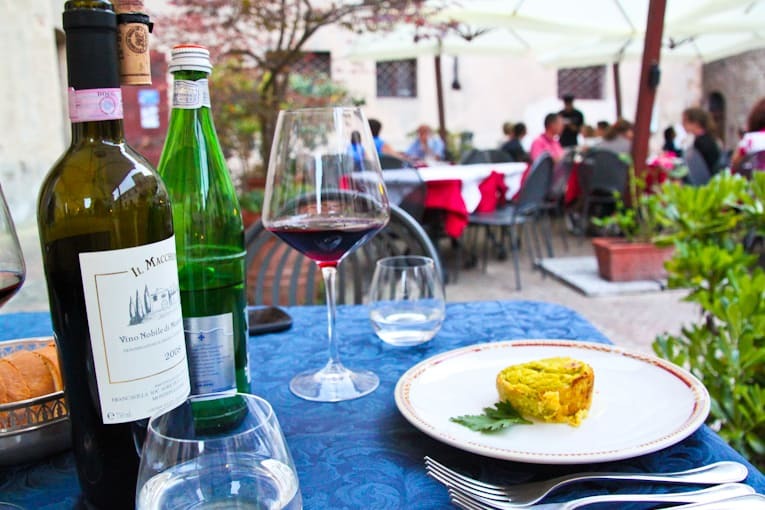 Hello Anjali, I just came across your blog, it’s wonderful, and NOW I am psyched to go to Montepulciano at the il Sasso Italian Language school as well as enjoy the eateries you mentioned. I am going in September and looking for a place to stay near the heart of town and school. My wife and I were hoping to find a room with a balcony for the two weeks. Do you know of a place or a person to contact? Thanks again for the informative blog! Hi Nicholas! Aw yay!! 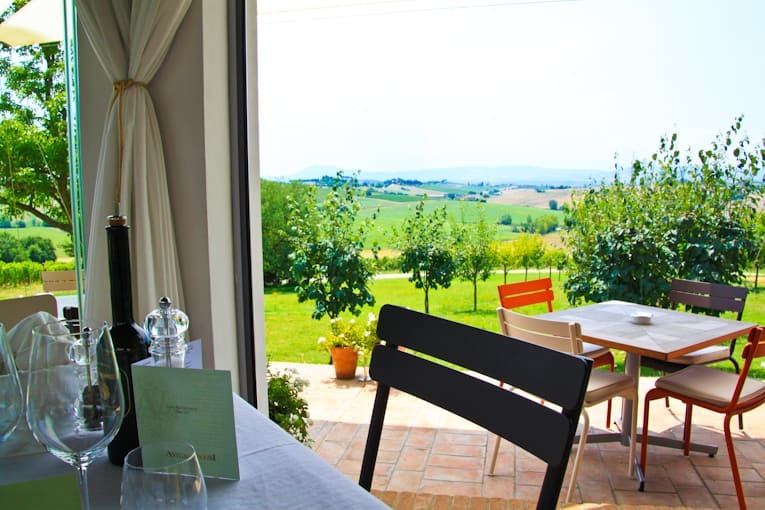 You guys are going to have an amazing time 🙂 If you guys want a room with a balcony (and you’re ok with being on the first level) – then the place we stayed at in Montepulciano would work really well for you! They have individual mini cabins, and each cabin has a little front porch/garden/balcony type area where you can sit out and relax. But since most of the cabins are one level, the porch is just on the main floor. If you wanted to find a room in a house or something like that I’d try airbnb! Hope that helps, and have a great time! Hi! 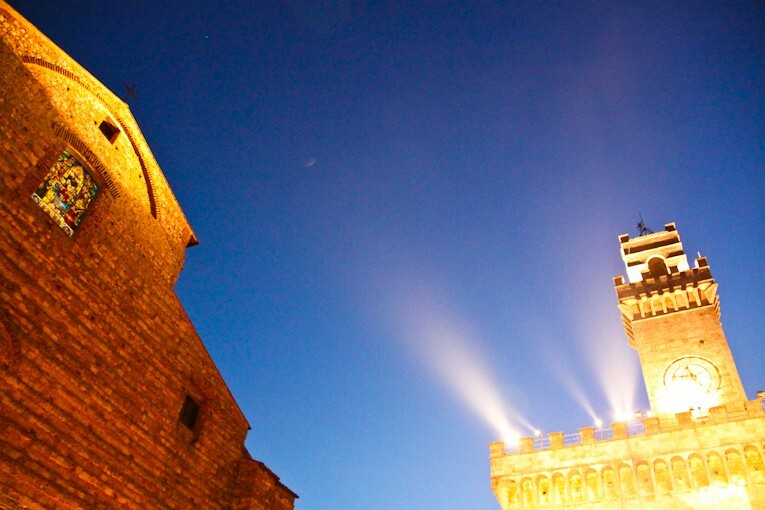 I came across this blog post in a search of all things Montepulciano. 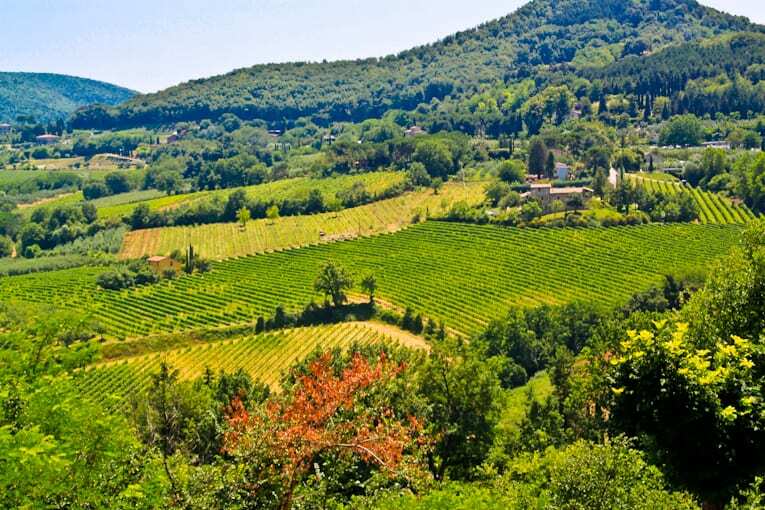 We are debating about spending 4 nights in either Montalcino or Montepulciano. Based on you seeing both, which would you recommend basing our stay in? Hi Rachel! Honestly you can’t really go wrong with either one. It depends on what kind of experience you want. We chose Montepulciano because we really loved the hotel we stayed at (I think there are more hotel options in Montepulciano), and because their downtown is a little bigger so there would be more things to do / more food options in the town itself. Also it’s more central and closer to the highway so you have easier access to the other towns. Since we stayed in Montepulciano, I’m obviously biased towards that 🙂 Montalcino is also beautiful, but it’s smaller and quieter and there’s less to do in the town itself – so it has more of a “sleepy” feel. But I’d just look into both and choose the one that best fits what you’re looking for! Hope that helps! I’m a huge fan of Frances Mayes’ Under The Tuscan Sun, and went on to read all her books. 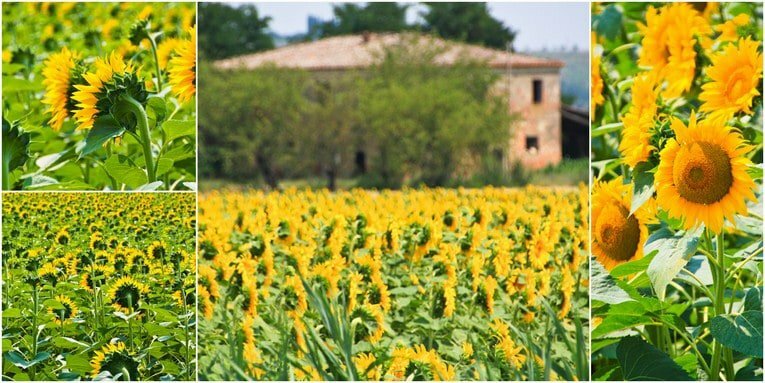 It is my dream to visit Tuscany at least once in my lifetime, and this post only served to add fuel to that fire! 🙂 I hope we do make it some time! Gorgeous pics! 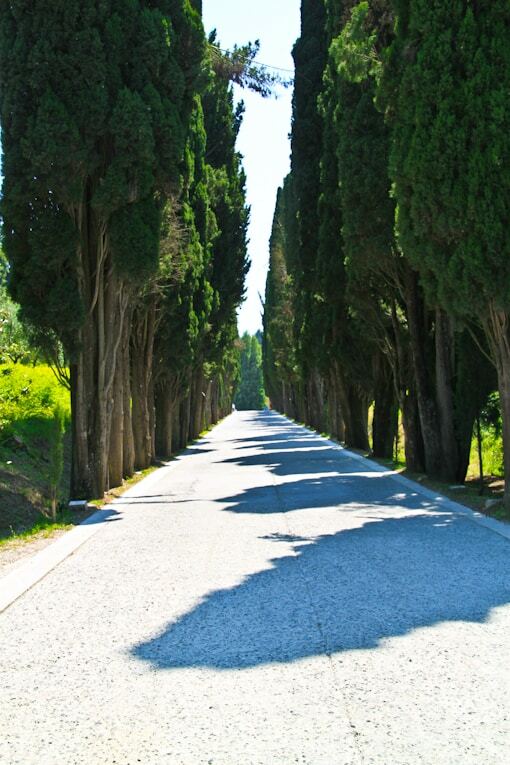 I enjoyed reading your blog on Tuscany. Do you remember the name of the honey shop or where it was located? We are visiting in a few weeks. We are also going to Avignonesi per your suggestion. So excited! Thanks! Hi Laura! I’m so excited that you’re going to Montepulciano! You are going to love it. 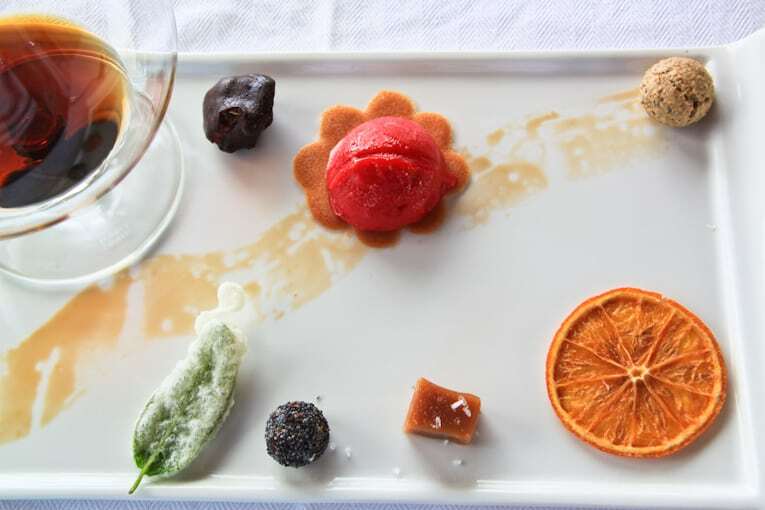 And I can’t wait for you to try the experience at Avignonesi! It is absolutely amazing. For the honey shop — honestly, I wish I could remember the name of it but I don’t :/ but, since Montalcino is a really small town, I’m pretty sure if you just walked around for a while you’d bump into the honey shop. Hope you have an amazing time!! Hi Gina! This was in July – the middle of summer! It was beautiful honestly – I’d highly recommend going at that time of the year! 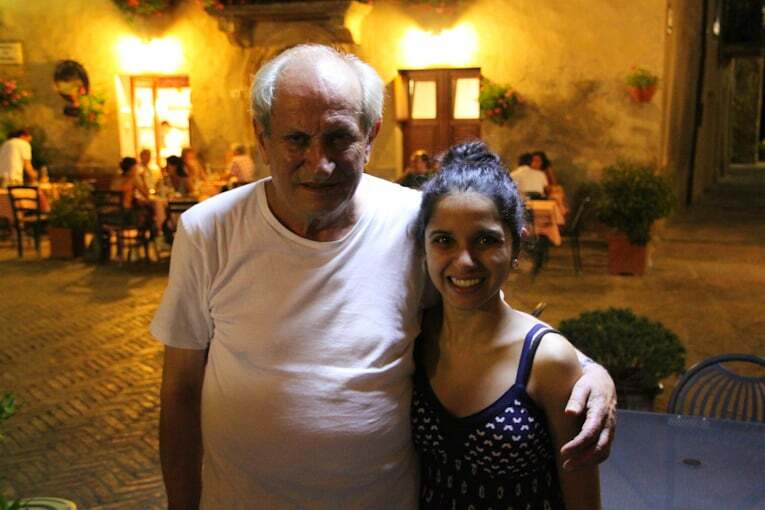 After reading Anjali’s blog last year I spent two weeks in Montepulciano at the il Sasso Italian Language school. That was in April and the weather then was so great. The small city is perched up high and the views are just spectacular. The ‘city’ is quite small and walking around, while a bit up-and-down, is great fun. Lots to see, places to stop at and very picturesque. The surrounding area too, like Cortona, is also well worth spending time in. I loved it all. Hi – just a passing comment. Also found your blog by accident but so glad that I did! Just had to leave a comment to say thanks for this great info. Will definitely be using your recommendations whilst we’re in the area. Oh great! I’m so glad this post was helpful to you! Omg that’s amazing!! 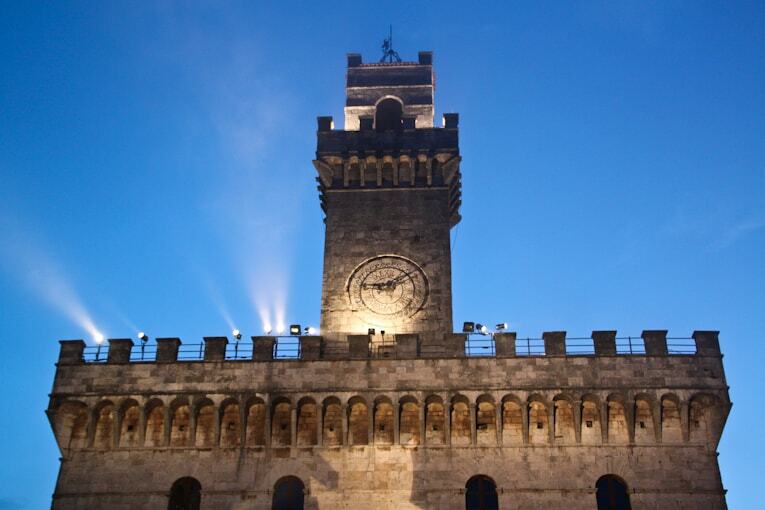 I’m so happy to hear that – you will love Montepulciano! Have a great trip Coral! Like some of these others, I found your blog accidentally, doing a search for “outdoor restaurant Montepulciano.” I’m still a year away from my trip (a friend says the two best things about a trip are planning it and remembering it) and we’re going to spend a day in the Montepulciano/Pienza area, and I’m going to have to plan to dine at Ristorante il Rossellino. What a fabulous meal you had! And that kind of interaction with owner/chef would be so special. Thanks for the excellent report and the beautiful pictures. Hi Robin! That’s so cool how you came across my blog, and I’m so glad you found this post helpful! 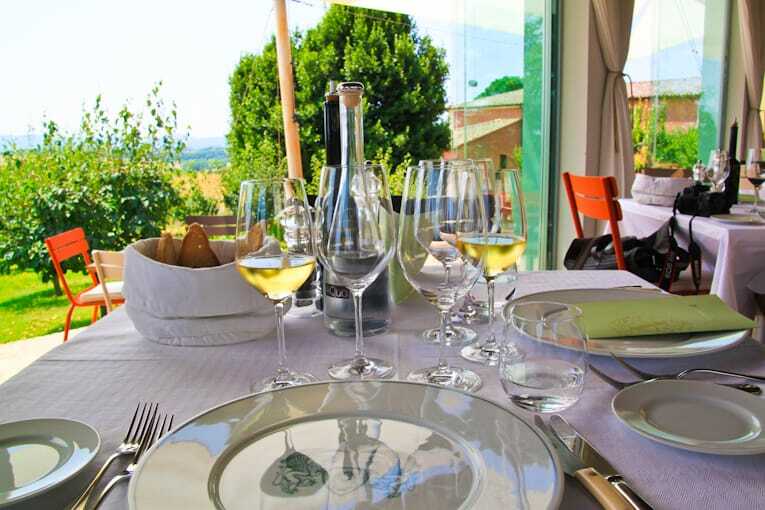 And yes – you must go visit Ristorante il Rossellino – it really was a special experience. You’re going to have a wonderful time – I’m so excited for you! 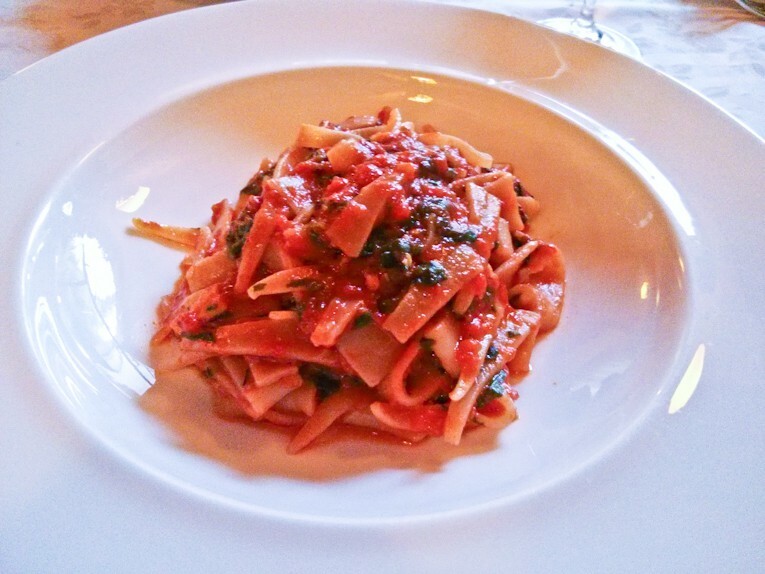 We just got to Montepulciano today and this blog came up in a restaurant search. It’s fantastic – thoroughly impressed. Thanks for the advice – we’re going to try La Grotta tomorrow!!! Just stumbled across your blog and absolutely love it. You have an excellent writing style and such great photos. 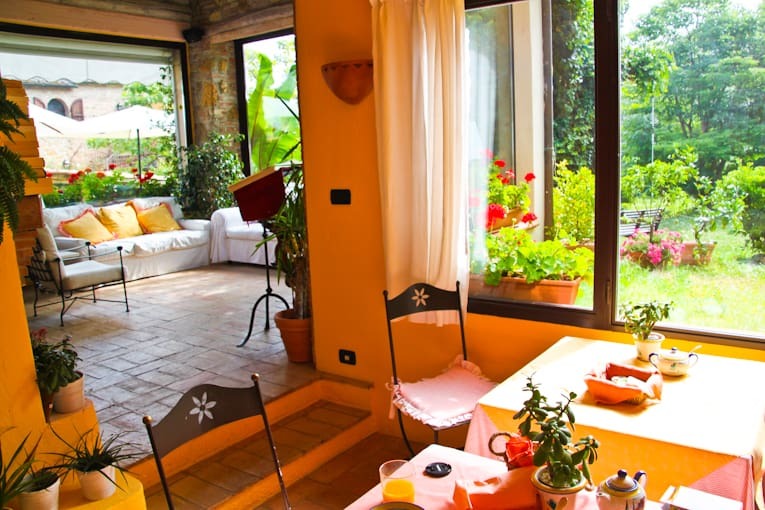 We are actually considering staying at the Regais in Montepulciano in June and wanted to ask you what studio you stayed in? Is it the one facing the woods? Hi Shruti! It’s so great to “meet” you! I’m so glad you are enjoying my blog 🙂 So we stayed in the room facing the little garden outside the breakfast area. It was right next to the pool. We didn’t stay in one of the cottages or suites — ours was just one of the regular rooms (king sized bed, bathroom with jacuzzi tub). Hope that helps! Enjoy your trip!! We absolutely loved Montepulciano! I’m in total agreement! I’ve just completed two weeks at the language school there [il Sasso] and just loved it. The view from my rooms out east meant I greeted the sun every morning …. and almost every morning and evening I took a photo out of the window … I have a whole collection titled “East of Montepulciano”. The changing light, small smoke columns, mist/fog in the valleys, with the mountain ranges disappearing in the distance …. just magic. Just be aware …. 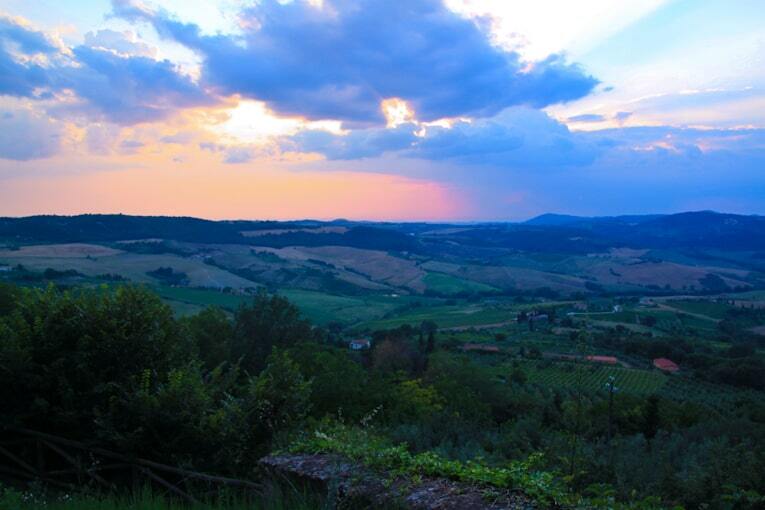 the “Monte” in Montepulciano, naturally, means “mountain”…. 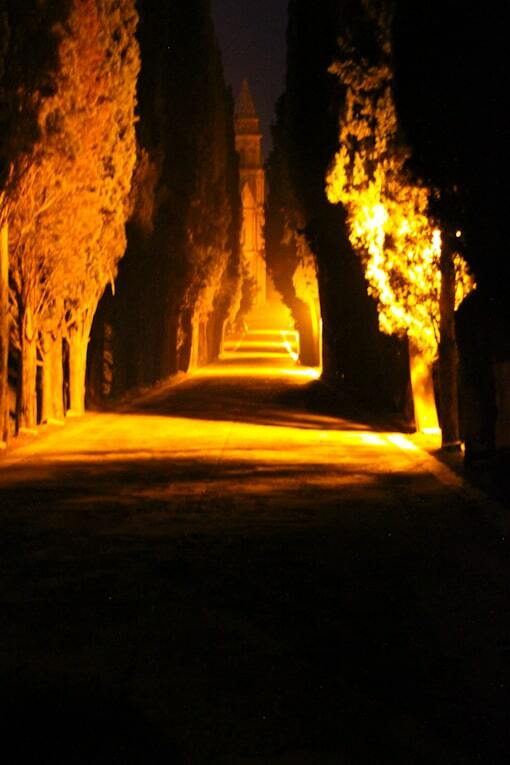 and in Montepulciano there are generally only two directions, “su e giu” … UP & DOWN. Its a wonderful place full of great people … Spend a while there, shop at the same shops, practice your shaky Italian and the people just warm tp you. I’ll be back. 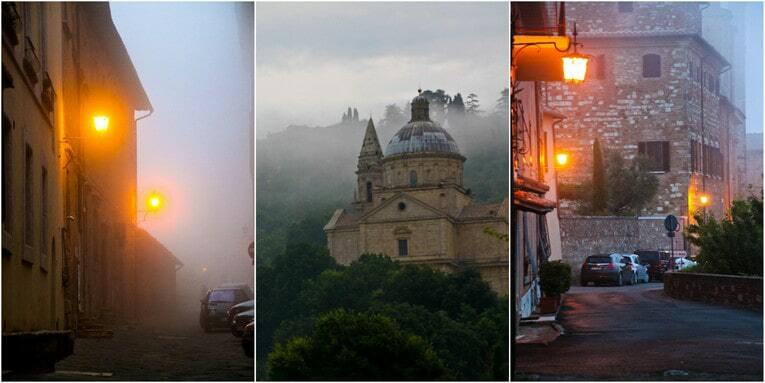 I’m planning a stay in Montepulciano at a language school, classes each weekday morning. 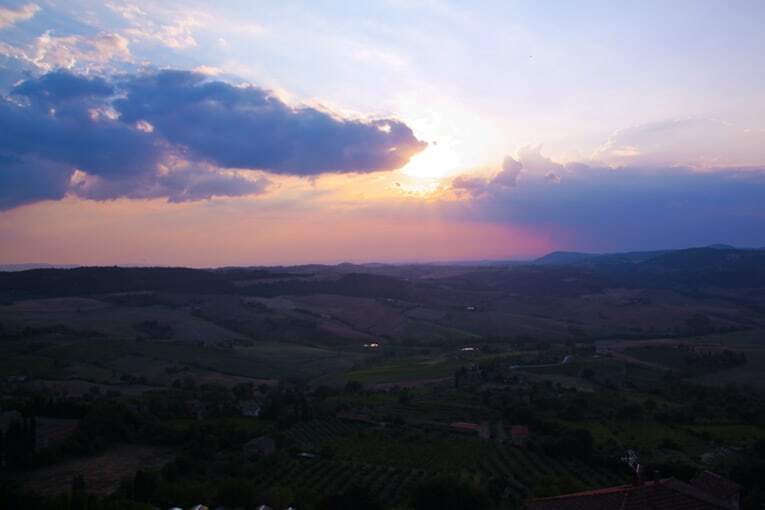 Is two weeks too long to spend in Montepulciano? Thanks so much Don! 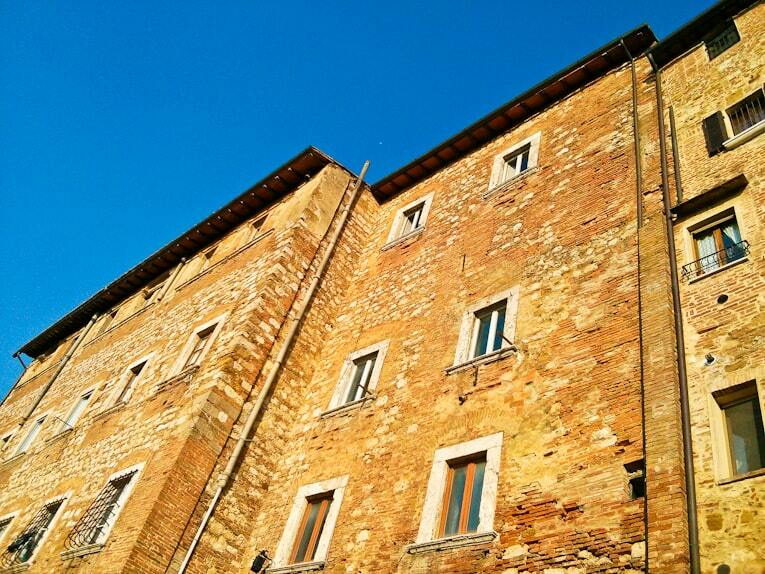 What a great idea to stay at a language school in Montepulciano – that will be an amazing experience! I don’t think 2 weeks is too long – honestly I feel like I could hang out in that region forever – not because there’s a lot “to do,” but more because it is beautiful, relaxing, and has delicious food/wine. Have a wonderful trip!! Hi Porcelina!! Thank you so much for your kind words 🙂 I’m so glad you are enjoying my blog – it’s great to meet you! And yes! You must go to Tuscany — we could have spent weeks there if we had the time. Stay well!